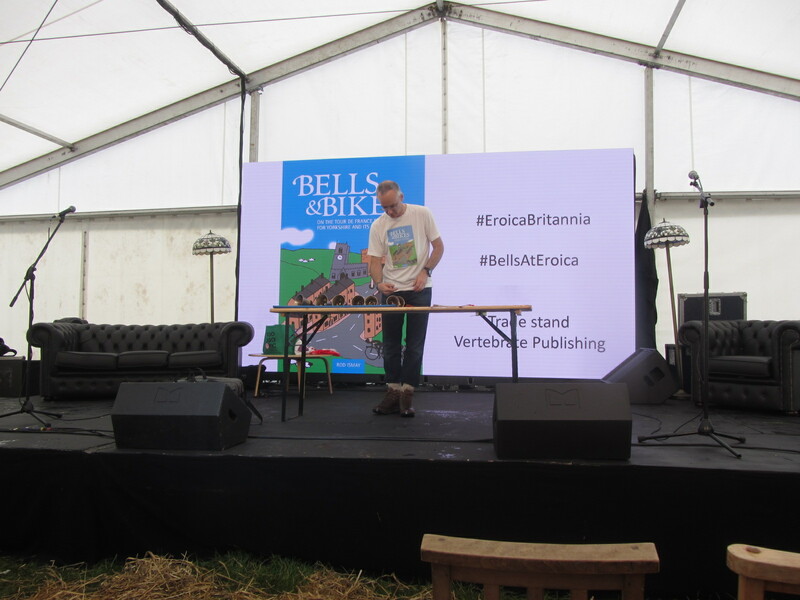 Bells & Bikes was the opening act in the Arts Tent at Eroica Britannia 2016; telling the story of church bellringing for Le Tour de France in Yorkshire. 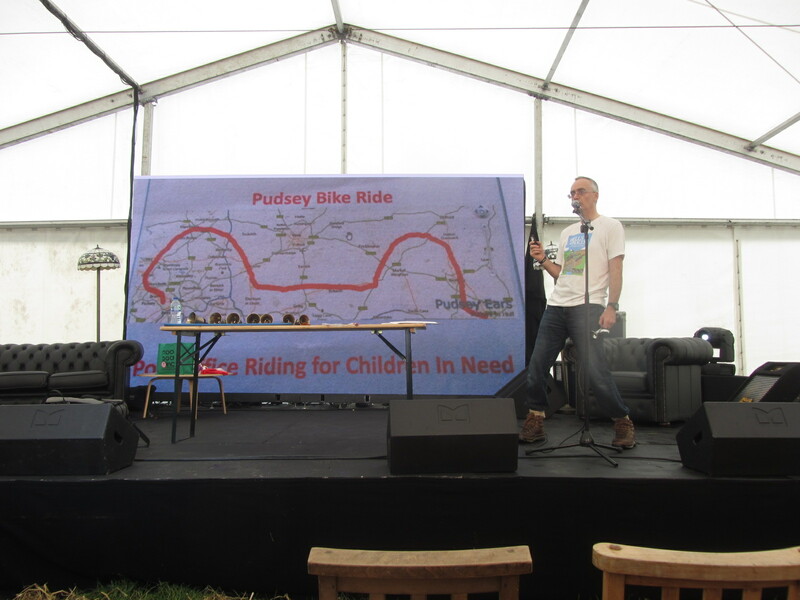 The audience also enjoyed stories and images of Yorkshire churches, the Dry Stone Wall Bike of South Yorkshire and Woolly Bikes. 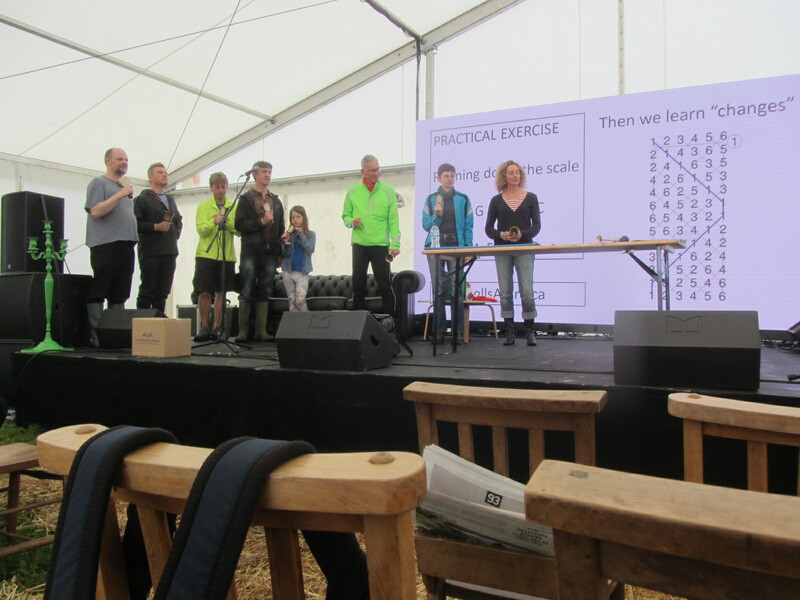 In the clip below we see audience members on stage to learn to ring “rounds” on handbells. Further down we see further photos of the event. Some of the audience went along to Tideswell church later that evening to join the local bellringers for practice night. And pub. Bakewell church bellringers also kindly opened their tower on the afternoon of the talk, for anyone interested to go up and see the bells. 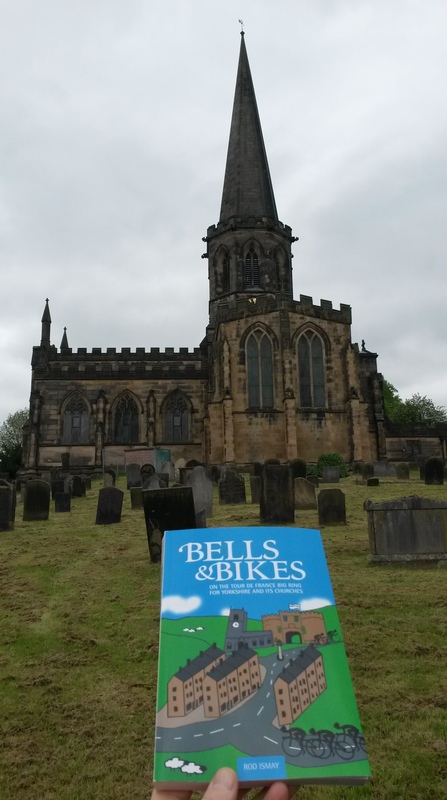 If you are inspired to have a go at church bellringing why not type “bellringing + your county” into Google and it will take you to contact details and relevant churches near you. 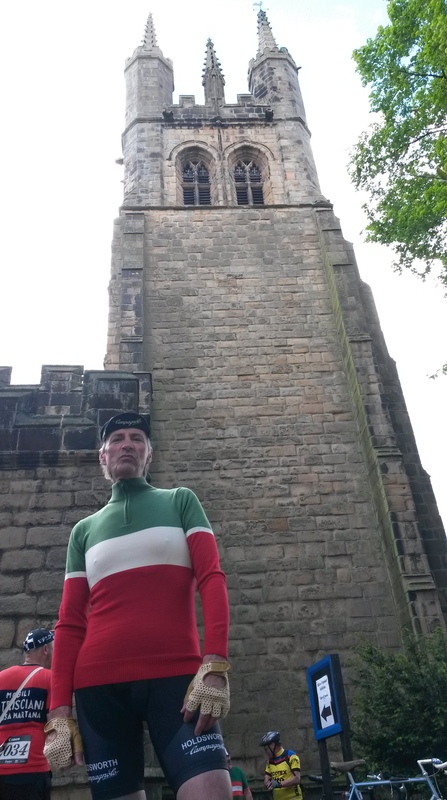 If you want to have a go in the Peak District, the heartland of Eroica Britannia, please visit the Derby DA bellringers site below. Enjoy! 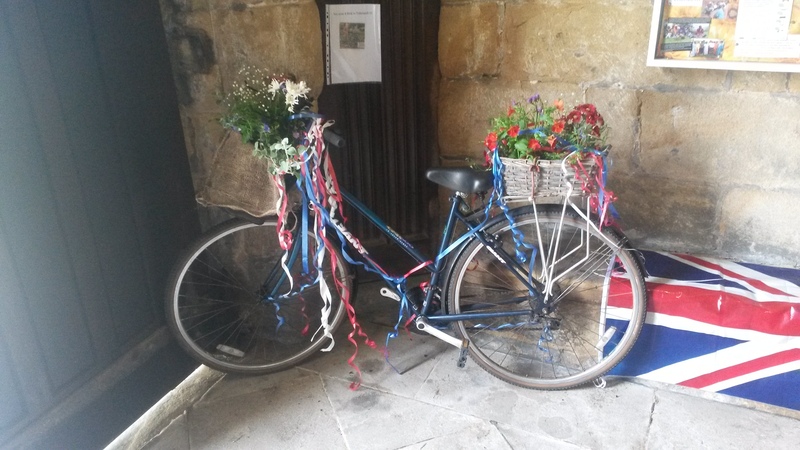 Here’s a couple of photos of Bakewell and Tideswell churches too. They are the biggest buildings around. You can’t miss them. 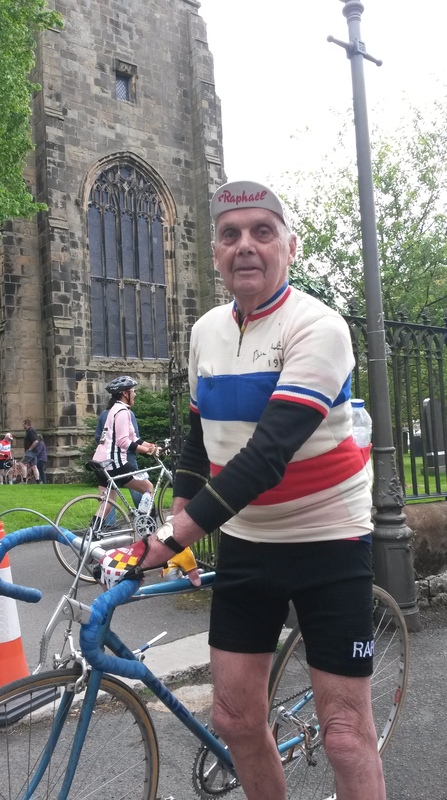 Bakewell (first) and then Tideswell. The tower entrance at Bakewell is on the north side (the right hand side as you walk up the hill). The tower entrance at Tideswell is inside the church itself. 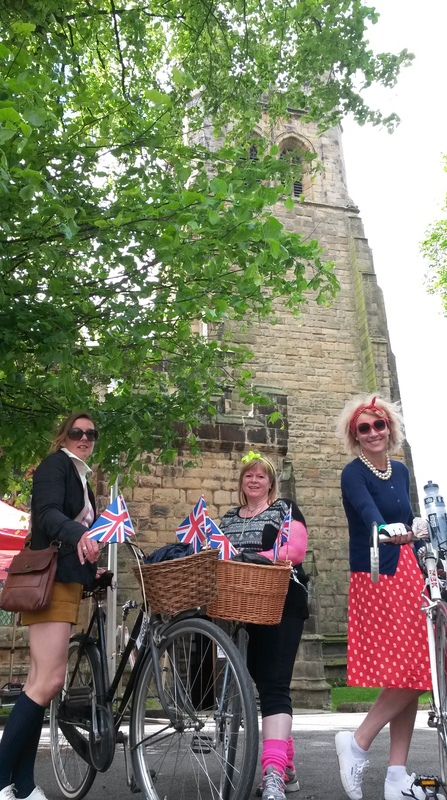 Eroica Britannia began in 2014, bringing cyclists from all over the world to the Peak District. 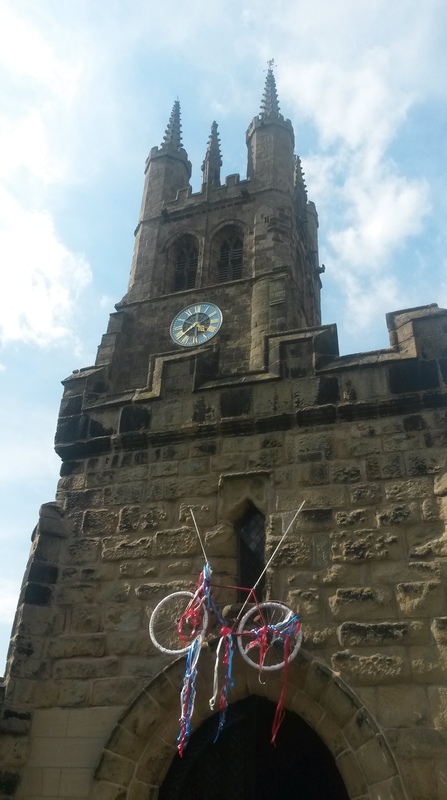 We rang Tideswell church bells as a welcome in 2014 and 2015 and thoughts now turn to the weekend of 17-19 June 2016. 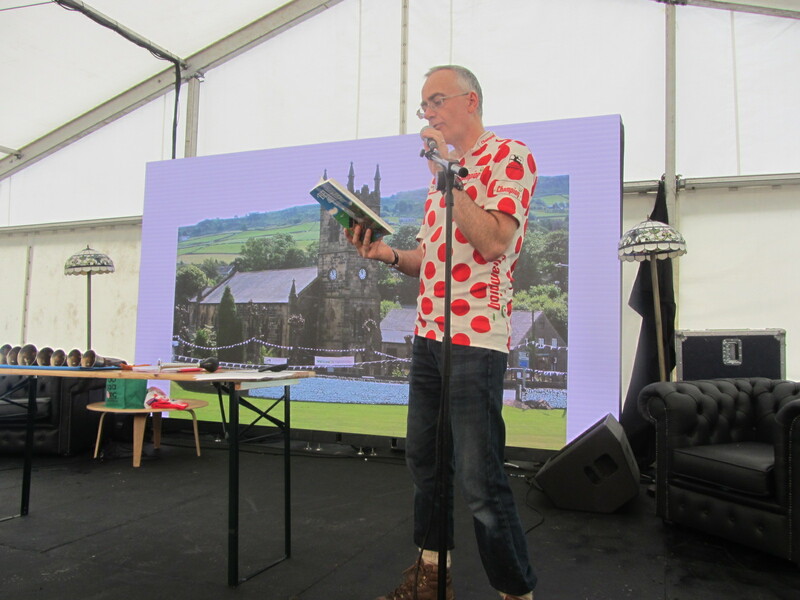 Last year I met a Tour de France stage winner cycling through Tideswell. 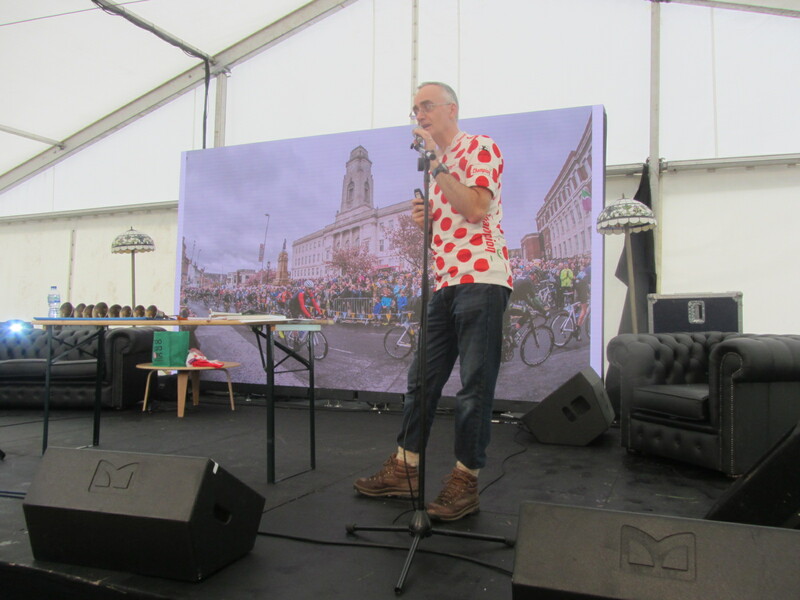 As he rode round the corner from the bakery I thought I know that chap, so I shouted “hey up Brian, how’s your ride been today?” It was Brian Robinson, Britain’s first Tour stage winner from 1959. 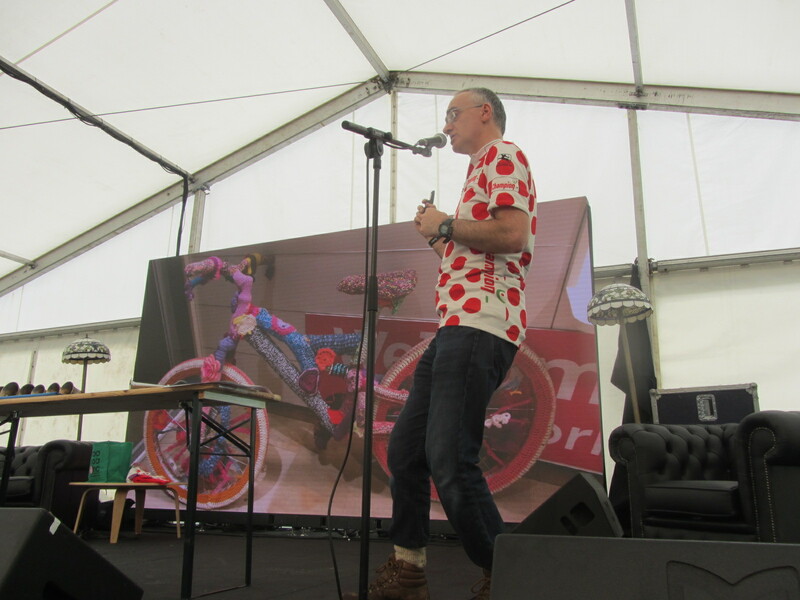 He’d had a good ride and was enjoying l’Eroica along with thousands of other equally well dressed riders in this festival of smart cycling. Here he is by the church. 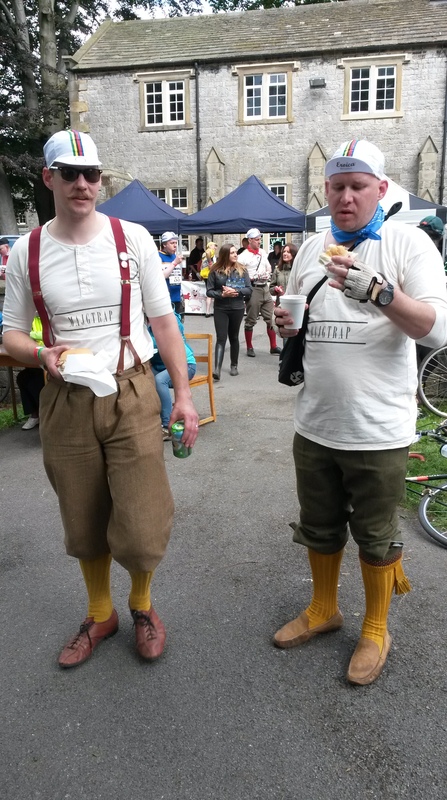 Here are a few more photos of the cyclists at the very fine food stop for the riders below the tower at Tideswell in 2015. 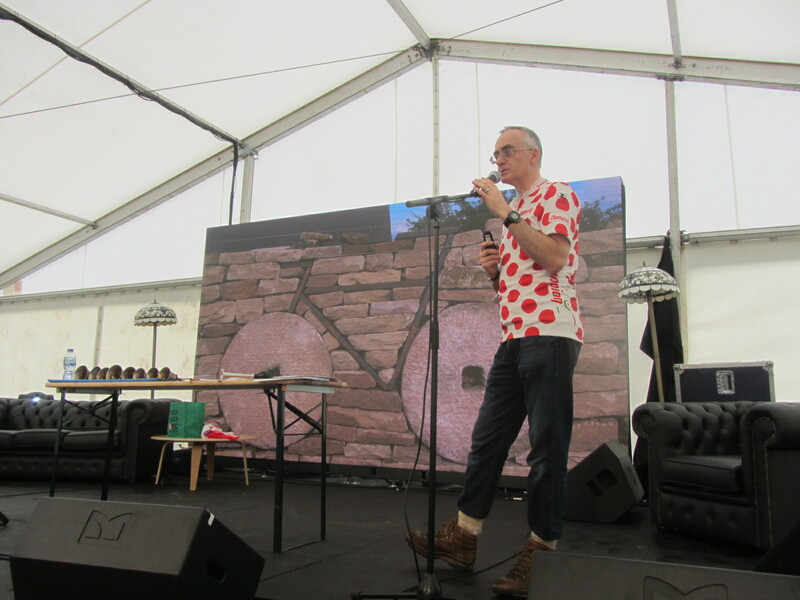 And here’s the well dressed church in 2014. 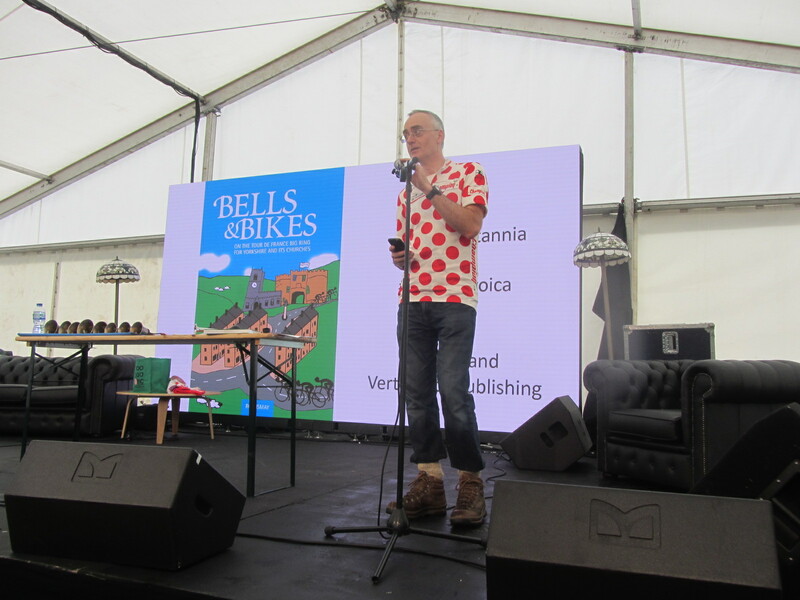 Join us in June for more “Bells and Bikes” at Eroica Britannia! 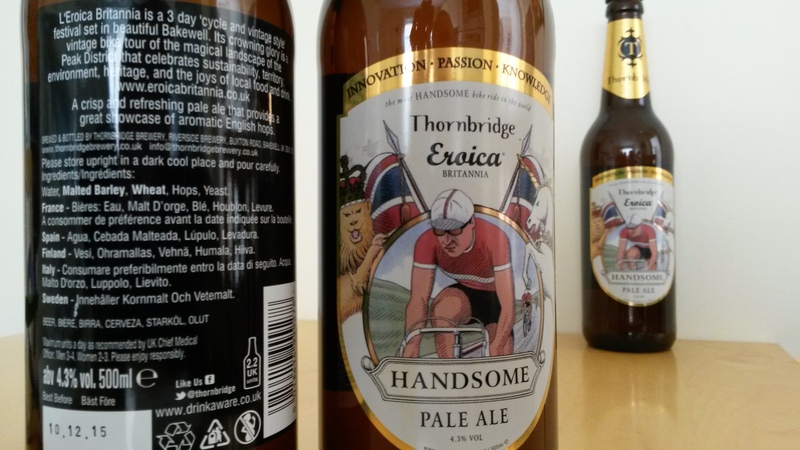 Click below to visit Eroica’s own website.